1 of the greatest video games ever made gets the video slots treatment in Tetris Super Jackpots. Created by Bally, it’s a 5 reel, 243 ways to win game that comes with free spins and a shot at landing a bumper jackpot prize. Play on all devices from between 50p and £100 per spin. Tetrimino feature – on any spin, 1 or 2 Tetriminos can be placed on or above the reels. These watermarked blocks can appear in their standard shape or rotated. Any position that’s covered by a Tetrimino that can morph into a standard block to deliver a payout. Up to 4 extra rows can be added to reels here to increase your chances of landing a decent combination. Free Games Bonus feature – this round is triggered by landing the scatter on reels 2, 3 and 4 on the same spin. The action takes place on an expanded 5 reel, 8 payline machine. Land a winner here and it leaves a Tetrimino watermark which will then drop to the bottom of the reels (just like in the video game). If you get 2 full rows of watermarked symbols, a special bonus is awarded with the watermarks breaking up and dropping to the bottom of the reels. The round continues until the watermark breaks the top of the reels. Jackpot Bonus feature – these prizes can only be won from within the Free Games Bonus feature. The thing to look out for here is the Gold Watermark – if you see this and it breaks through the top of the reels, you’ll pocket 1 of either the Minor or Major fixed jackpots. 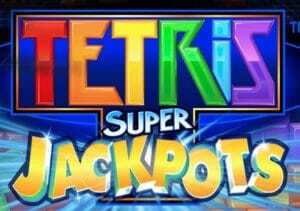 There are few visual flourishes on show in Tetris Super Jackpots. Then again, you could say much the same about the original video game. This is all about simple, repetitive action. Fans of the original Tetris should find plenty to enjoy in this video slot reboot. If you’re after a simple game with some unusual extras then this video game adaptation is one to consider. If you want bonus features, you’re best looking elsewhere with Titanic from Bally a better option.